Decorative stone tiles have been used in architecture for thousands of years. Ancient Roman buildings, for instance, were often decorated with lively mosaics capturing scenes of history and everyday life. 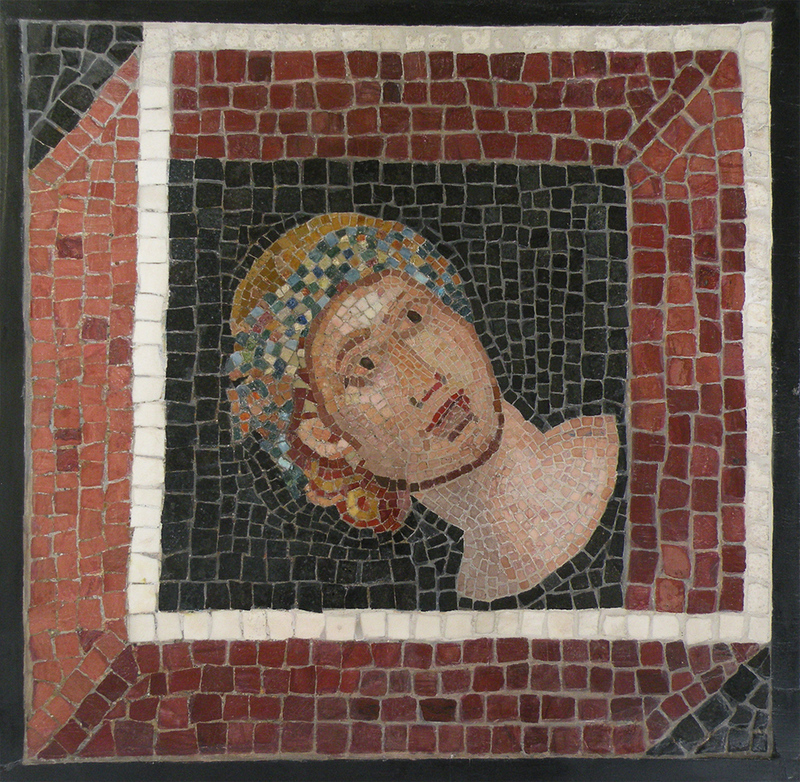 By 200 BC, “tesserae”, small colored tiles, were being specifically manufactured for Roman mosaic artwork. Only a few millimeters in thickness, tessarae provided a level of detail that imitated Roman fresco and encaustic paintings. 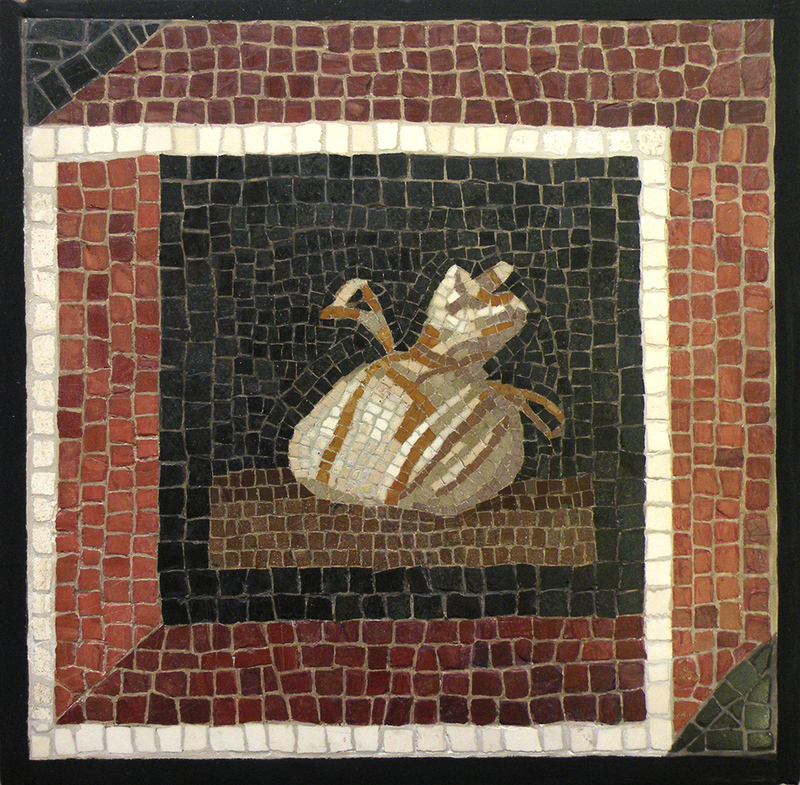 Fine mosaic artwork was seen as a reflection of wealth and status in Roman society. Recently, eight small, Roman mosaics were bought from Sotheby’s, London, by a Chicago couple for their private collection. 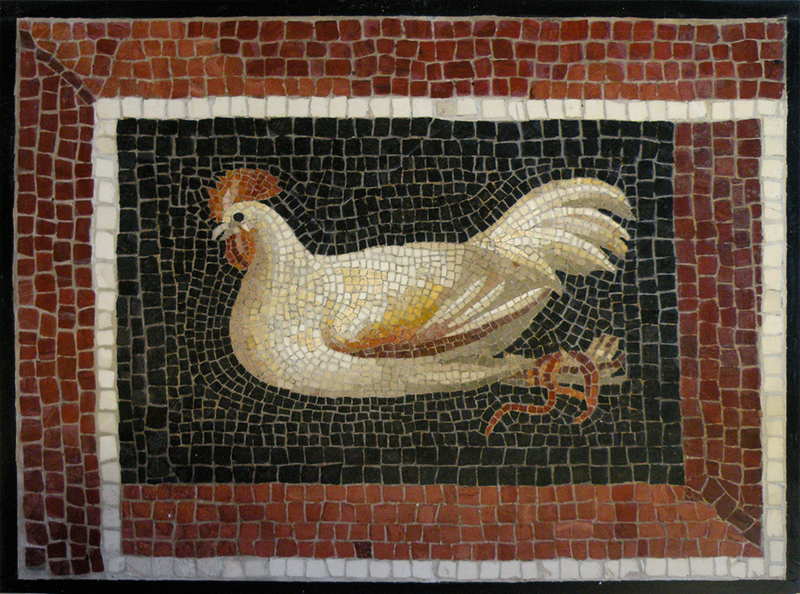 The mosaics were originally part of a marble tesserae floor from a villa on Monte Rosario near Rome. The mosaic floor wasn’t discovered until 1823, when two Englishmen, Lord Kinnaind and Lord William Russell, traveled throughout Italy. They visited the excavation site, and arranged to jointly purchase the floor, have it restored in Rome, and then brought to England. The mosaics were brought to Woburn Abbey, near Bedford England, where they were incorporated into a new mosaic floor, with reproductions having been made of any missing areas of tile. Literature is scarce, but at some point the floor in the abbey was disassembled, and the original parts of the Roman floor were exhibited at the National Gallery of Edinburgh from 1989 to 2009. When the exhibit closed, the mosaics were auctioned at Sotheby’s. Miraculously, two female allegorical heads and six still lives, all part of the original floor, were never separated, even though they were sold in three (3) separate lots at auction. The Chicago couple bought all eight so that they would remain together. The eight mosaics were brought to Parma Conservation for treatment. They were structurally stable, but had been dramatically compromised by several aesthetic interventions. Microscopic observation and testing showed that the mortar between each tessera was actually comprised of colored wax. Missing tesserae were filled with yet more colored wax. On top of that, the original tiles and wax were heavily overpainted, obliterating any semblance of the original tiles. Treatment began with the removal of the overpaint, which immediately showed which tiles were original and which were simply made of colored wax. The wax that was used as grout was removed around each tile, a meticulous process using small dental tools that took months to complete under binocular magnification. The process was painstaking, but ultimately rewarding. What finally emerged were eight beautiful Roman mosaics that had distinct patterns, shadows, and details that had been hidden for so long. In addition, conservation revealed the color and uniqueness of each individual tile, some as small as 1/8”, which led to the vibrant, authentic images we can now see. When the true mosaics were revealed they were carefully re-grouted with an inert, reversible substance that was as close to the original Roman materials as possible. Finally, the grout was inpainted to approximate the neutral tones for each color. Missing tiles were replicated in texture and color in order to match adjacent tiles and patterns. Conserving these eight Roman mosaics was most humbling. Two thousand years ago they were part of a floor in a Roman villa. They survived from the 2nd century A.D. to the present day despite installation, excavation, restoration, reassembly, disassembly, exhibition and auction. Even more astounding, all eight pieces survived together, and are now safe, together, in a private collection in Chicago. © Parma Conservation. All rights reserved.